Affected teeth don’t just turn yellow or brown. Periodontal disease is an infection that damages the tissue and bones that support the teeth. If left untreated, dental disease causes the gums to become inflamed, resulting in pain, periodontal pockets (spaces between gums and teeth), leading to irreversible gum recession, infection, rotting bone and loose teeth. But it doesn’t stop there; pet’s suffering from periodontal disease place a greater strain on internal organs such as the liver, heart and kidneys and also have a decreased ability to combat disease and infection. The process of periodontal disease is why we have recommended a dental clean and examination for your pet. In short, good oral hygiene can add many happy years to your pet’s lifespan. We understand that with any pet ownership there are some cost considerations. For the health of your pet and your wallet it is best to perform a dental when there is a smaller amount of disease, this is known as grades (see dental grades page). We also we offer different levels of supportive care for your pet when they get their dental performed. For more information please read on. Pre anaesthetic blood testing identifies how the kidneys, liver and immune system are functioning. It also ensures that there are no issues with blood clotting and that oxygen transport and tissue perfusion will not be affected by an anaesthetic. With the metabolic knowledge on hand the veterinarian can individually tailor the anaesthetic to your pet. Sometimes problems are identified that require attention before the general anaesthetic and dental procedure occur. Intravenous Fluid Therapy is another tool that we can use to make general anaesthetic as safe as possible. By starting intravenous fluids a few hours before surgery, we can make sure that your pet is well hydrated, which in turn provides better blood circulation and therefore ensures maximum oxygen delivery to tissues during the anaesthetic. During an anaesthetic, fluid rates can be changed to help control your pet’s blood pressure. It also provides a continuous access point for injectable anaesthetics, pain relievers and should the need ever arise, lifesaving medications such as adrenalin. After surgery intravenous fluids are continued into the recovery phase and this helps flush the anaesthetic from your pet’s system, which leads to a quicker recovery. Intravenous fluid therapy is so important that if your pet is over the age of 7, this support becomes compulsory. Best Care allows the dental procedure and the associated general anaesthetic to be the safest possible for your pet. Best Care package includes pre anaesthetic blood testing, intravenous fluids and the dental descale and polish. Premium Care includes the benefits of Intravenous Fluids and the dental descale and polish. Dental only includes the dental descale and polish of teeth only. It is safest to undergo a general anaesthetic with an empty stomach, just like when we go under a general anaesthetic. Dinner can be eaten the night before, but no food after 7pm. Water can be given throughout the night and taken away first thing in the morning. For your pet’s comfort it is recommended to have a small walk before coming to the clinic so they can relieve their bladder and bowels. If your pet is taking any medication, please ask us about any special directions prior to the anaesthesia. The morning of the procedure you will have an appointment with one of the nurses, they will ask a series of questions to allow us to make your pet’s stay as comfortable and safe as possible. After admittance, your pet stays in a warmed kennel with plenty of bedding. All of our patients receive a general health check from the Vet; this includes listening to the heart and lungs, checking temperatures and examination of the mouth. If you have elected to perform a pre anaesthetic blood test and administer intravenous fluid these procedures are performed. The Veterinarian will then create a tailored anaesthetic plan for your pet, dependant on vitals and test results. Prior to the general anaesthetic, your pet will be given a premedication. This takes the edge off and actually halves the amount of injectable general anaesthetic that is required. Once the premed has taken affect, an injectable anaesthetic is administered into the vein; this sends your pet off to sleep very quickly. After your pet is asleep, an endotracheal tube is passed into the trachea or windpipe; this allows us to deliver a gaseous anaesthetic and oxygen mixture to keep your pet asleep and keeps the airway open and secure. While under a general anaesthetic the Vet, together with the anaesthetic nurse, monitors your pet’s heart rate, pulse, breaths per minute, temperature, oxygen saturation, blood pressure and level of anaesthetic. This is a continuous process and your pet has trained professionals by their side throughout the entire procedure. While under the general anaesthetic, your pet’s teeth are cleaned from just under the gum to the tips of the teeth with an ultrasonic scaler. This is very similar to the one that human dentists use on your teeth. After careful examination of each tooth the teeth are polished, this produces a smooth surface, discouraging new plaque formation and extends the longevity of the dental clean. Only about ½ to 1/3 of the tooth is visible above the gum. Therefore ½ to 2/3 of the tooth is unable to be examined visually. If there is anything suspicious found during the cleaning and examination of the teeth, it is best to x-ray the tooth so an accurate treatment decision can be made. 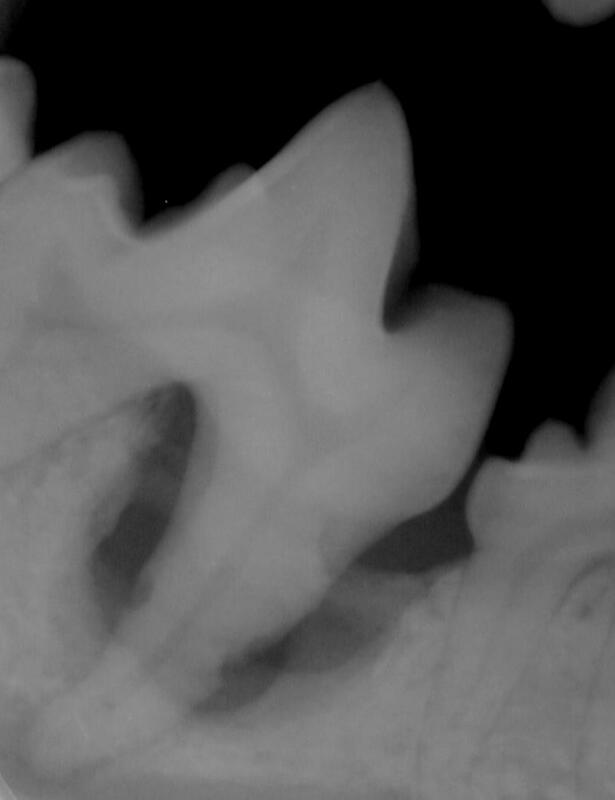 X-ray of lower Carnassial, a large molar tooth used for chewing shows significant bone recession (solid arrow) around the tooth root. Also small erosions can be seen on the root itself (dotted arrow). This tooth is diseased and needs to be removed. Should examination and in some cases x-rays, show that the periodontal disease is beyond repair, the tooth is extracted at the time of the dental. Before extraction local anaesthetic blocks are used. Once the tooth is extracted, the gums are stitched together. This quickens healing time and reduces pain. After the dental procedure is completed the gaseous anaesthetic is turned off and only oxygen is administered to your pet via the endotracheal tube, this allows them to wake up. The Endotracheal tube remains in place until swallowing is observed and only at this time is the tube removed. This allows the airway to remain open until your pet is awake enough to control breathing on their own. Once the Endotracheal tube is removed, it is time to go back to a warm kennel, with a bed and a blanket. Your pet is continually monitored by our skilled team in ICU until discharge. On collecting your pet you will have a discharge appointment with the surgical nurse. Home care instructions and any medication directions will be discussed in this consult. If you have any questions, please don’t hesitate to ask them.